Give or take a few destructive and heat-increasing Santa Ana winds, relatively chilly weather is settling in, even here in Southern California. So, I suppose it’s finally time to take on what I consider to be the king of hot cocktails. Still, what a blow to my ego to discover that, not only have I had some difficulty pulling off this most delicious of drinks, but that I’ve mostly been drinking it wrong, too! I’ve finally learned that Irish coffee tastes even better if you don’t stir in that pretty layer of unsweetened cream floating on the top. And for all these years I thought floating the cream was just a presentation thing. A true cocktail classic, Irish coffee might be hard for amateurs like me to pull off, but it’s also not so easy to provide a concise history. 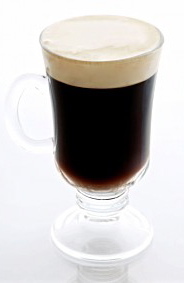 The most widely accepted version is that it was developed by chef Joseph Sheridan of Ireland’s Shannon Airport, who came up with the idea of adding whiskey to coffee to warm the cockles and other parts of travelers on bitter cold winter nights. Then, the story goes that Pulitzer Prize-winning travel journalist Stanton Delaplane brought the concept back home with him from an early 1950s trip to Ireland and reverse engineered the beverage with the help of the proprietors of San Francisco’s Buena Vista Cafe. Just to muddy the waters, though, L.A.’s temporarily closed Fairfax Blvd. landmark, Tom Bergin’s Tavern, also claims to be the American popularizer of the beverage. No doubt people in San Francisco will hiss when they read the above, because that’s what they do in S.F. whenever you mention Los Angeles in any context. I can hardly blame San Franciscans, though, for wanting to claim credit. Irish coffee is an amazing beverage which I’ve greatly enjoyed in both Southern and Northern California, not to mention New Orleans and maybe I’ll have it in Ireland some day. There’s nothing like the combo of caffeine and alcohol and this tastes immensely better than vodka and Red Bull. So, enough vamping, here’s the wondrous but tricky (for me) to pull off recipe. Using a whisk or whatever device you have handy, lightly whip heavy cream until it is very frothy, which I admit is easier said than done. Set aside. Get a glass coffee mug, but since you probably don’t have one, use a reasonably large wine glass, which also works beautifully. It’s best to heat the glass by putting in very hot water or holding it over steaming water if you’re afraid of breaking it. That may not be 100 percent essential if you do as I do and drip the coffee directly into the glass using a Melitta-style filter. Stir your sugar into the coffee thoroughly. Then spoon — do not pour — the cream onto the top of the coffee. (You can also try pouring the whipped cream over the back of a spoon, but that didn’t work for me at all.) Sip the coffee through the layer of cream on top. And for James Joyce’s sake, don’t stir it! I’ve probably attempted this six times at home and I’ve managed to get this drink right precisely once. Getting that heavy cream whipped enough so that it sits atop the coffee and doesn’t simply combine with it has been tricky for me, to say the least. More than once I considered the coward’s way out — sugar-laden canned whipped cream. It would definitely be easier. Some imply that if you simply pour heavy cream unwhipped over the back of a spoon it will somehow work. I’m here to tell you every time I tried the back of a spoon thing it failed to create the desired effect, whether or not I’d pre-whipped the cream. I’m not saying the results tasted bad, but they’re not nearly as heavenly as sipping the coffee through the cream. If you can manage to get it exactly the way I did that one time, it’s just the best warming pick-me-up/make-me-happy there is. If you’re really feeling lazy, though, a shot of Bushmills neat with a coffee chaser (or any chaser) isn’t so bad, either.